My Son, Tom, is a HUGE Calvin and Hobbes fan. Often on his website, he relays his feelings through the famed comic strips. His recent posting said everything I'm feeling about my temporary assignment -- that new experiences are rarely the ones you choose!!! 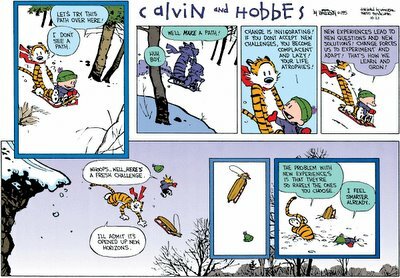 I'm glad I've had the opportunity to work on the Theater Property Book Team -- it definitely is everything Calvin and Hobbes say it is. Two weeks down and three to go. P. S. Thanks, Tom, for sharing Calvin with your Mother! It was sixty years ago today that my Mother and Father got married. They were able to spend a little more than 17 years married before he died in a car accident (some good years -- some bad years), but my mother always had fond memories and spoke fondly of her married years. I'm glad she remembered the good times and didn't dwell on the bad. She was a war bride. They married as soon as my Dad came back from a very long deployment during WWII. I have their "love" letters and look forward to reading them someday. Their wedding anniversary makes me think how much different things are today -- 60 years later. I'm the one deployed -- not my husband. (Although, he's doing everything he can to volunteer for the "cause"!) It's such a different time, different world, different war. We have CNN, telephones, and the internet. I'm able to keep in touch with loved ones much much easier than my Mother did more than 60 years ago. I was a late bloomer when it came to graduating from college. Time flies, as that was 1994!!! My personal goal was to be in a Master's program within five years of when I graduated. Where has the time gone?!?!?! Well....I finally did it. I have been seriously looking for the past few years for an online master's program (not MBA), that is directed toward leadership. I found it!!! I am a college student again!! I am a Leadership Management major enrolled in a 100% online Masters in Liberal Studies program. Wish me luck!!! Sarah had a fit that I'm now an Oklahoma Sooner, since her alma matre is one state away -- but I know she still loves me!!! I know that my big brothers advised me to keep my backside out of Iraq -- but duty calls and I'm back at Camp Victory. I got here on January 8th, to temporarily serve as the theater property book officer (PBO) for the theater equipment. That means I have a HUGE dollar amount of equipment that I'm entrusted with, along with 14 teams that manage the hand receipts and property. We have approximately 2500 customers or elements that we support throughout Iraq and Kuwait. The "real" PBO has some medical issues and was transferred to Landstuhl Germany for outpatient treatment. She's doing well (thank God!) and will be back here toward the first part of February. She and I will overlap for a few days, before I head back to Kuwait about the 9th or 10th of February. Each job I end up in, here in Theater becomes more challening that the previous. I honestly don't know how much higher I could get with regard to property book work. Each day amazes me -- some of it good amazing and some of it you wouldn't want to know about!!! I have 139 employees (a mixture of military, civilian, and contractors) among the 14 teams. Some of their talent amazes me, and once again -- some of them are nothing to write home about!!! Most of the contractors are retired military, and of course I can spot the retired Warrant Officers immediately. Must be something about the Warrant Officer "secret handshake". We'll never tell!!!!!! The best to you and yours in 2006!!! New Years Eve was fun here. Our unit had a party in a very large tent -- complete with hats, horns, crowns, and those crank ratchet noisemakers that make a terrible racket!!! We played bingo, some great music games, and had a great time. Lot's of good food, good fun, and were able to toast in the New Year with our non-alcohol champagne!!! A little excitement here tonight at my base camp. As we were finishing up our dinner, I was sitting with 5 other women -- all of a sudden there was a whole lot of commotion on the other half of the DFAC. At first I thought a fight had broke out, which was highly unlikely, as things like that don't happen here. Everyone was moving extremely quickly toward the door -- so -- we did too! Good plan, as the kitchen caught on fire. We all got out safely! I have no idea how bad the damage is, but I do know that anything that involves consumming a meal for the next couple of days will involve walking about 6 blocks away! No problem -- I need the exericse.